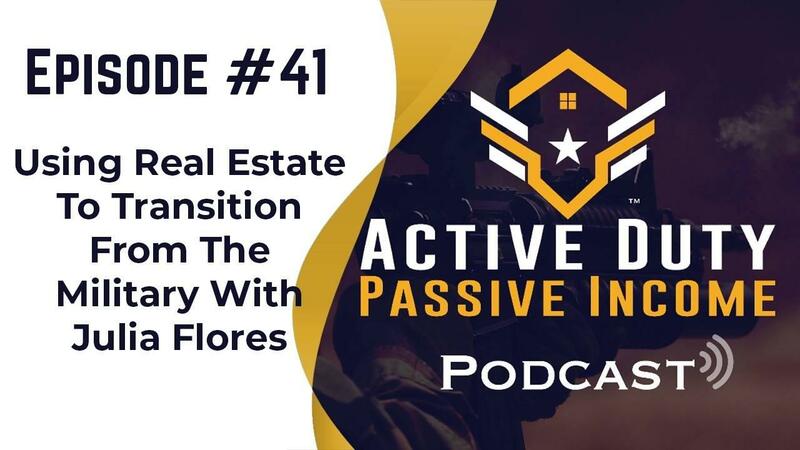 Mike: Hey hey what's going on guys welcome to the active duty passive income podcast. I am super super super excited today because I have an awesome guest on the show today. Her name is Julia and I met her here in the Norfolk area. we met up at a meet-up as a matter of fact at our first meet up or as a matter of fact no I'm sorry let me take that back. I met her at a meet up prior to our first meet up here. It was with Alex, Alex wooden field right? Julia: Yes for sure, opportunity I believe. Mike: Opportunity yes it was an awesome awesome event. We were talking about Airbnb and investing in the area and you know I had the fortunate pleasure of meeting you. you were you know just getting out of the military I believe right and you start your own Airbnb, which is crazy. Julia: Yeah that was very pretty crazy. Didn’t really anticipate going into the Airbnb field. But it kind of came my way and I jump on it. So that's where I am now. Mike: That is awesome and I am so excited to share your story out there with our listeners. So please tell us a little bit about yourself and your military background. Julia: Yes for sure. My name is Julia Flores. I'm 22 and I live in the Hampton Roads area. I joined the army right after high school. Because I knew I wasn't ready for college. So I wanted to do something different, something beyond myself. So I enlisted in the army as a vehicle mechanic. I enlisted for four years and was stationed Fort Bliss that whole period of time and then I recently just got out the army this past May to pursue my passion in real estate. Mike: Outstanding man, super super pumped man. Because you know you served your time and you served your country, you found your passion in real estate and you went on and you transitioned. So can you walk us through that transition period? How was it for you? Julia: You know I try to prepare as best I could. You know you go through these classes and they try to teach you what to do and how to transition. But you really just got to experience it for yourself to really know how it goes. I think the hardest thing for me to transition out was to leaving my friends behind you know like joining the military you meet great people and then all of a sudden you're not around them day in a day they out like you used to and I think that was the hardest thing for me to transition out of. But besides that like you just got to let it go and understand that you just made a transition for the better and you know keep it moving to the best you can. Mike: Wow outstanding, yeah I completely agree with you. I'm actually going through a transition myself. I'm out of the Navy in 23 days, 23 days and Counting. I know right I'm so excited and hopefully. I'll follow your footsteps. Thank you I appreciate that. I'm looking to follow your footsteps and pursue my passions in real estate. Real estate investing, but really the greater real estate world and trying my hand at a little bit of everything. But I'm super super excited. But yeah can you tell us a little bit about you know what it is now that you transition to and you just kind of share your story. Julia: Yes for sure. So I kind of realized pretty quickly that I wasn't going to do 20 years in the military. so I started really thinking about what I was going to do next and real estate was something that was always in the back of my mind and I was like why not you know I had this really cool thing called the VA home loan. Why not use it when I get out and see how that works for me. So while I was transitioning out looking for a job and my mom she also is in real estate and she owns a couple eight unit apartment and she afforded me the opportunity to kind of jump on this idea of this Airbnb thing. So I got back in the area around May on the Thursday and she pretty much hit me up a week before I was like hey would you be interested in partnering with me and turning my apartment into Airbnb and of course me being me, I was like of course why not let’s do it. I didn't have a job anyway. So why not right. We start doing that, why not. So and it was time to feel that I was interested in anyways. So we partnered up and the moment I got back, I jumped in with her and we are in currently transitioning, almost transitioning 16 apartments in to Airbnb. We are at 7 right now and that's kind of where I've been since getting out the army. Mike: Wow okay. Get out of here. So you guys are almost in full steam then huh? Mike: And you guys started this in May or where did you guys start this before May? Julia: No we started this, I think it was the end of April to be exact. But May is when we really like started grinding it out. Mike: Wow okay. So dang man so really not that long. Julia: Yeah so this was an idea my mom had a guest for a couple months. I didn't know about it until she proposed to me the idea. So she had a new vacant already. So I pretty much jumped on it and we did it one by one. Because it was just pretty much me and her and sometimes got the call in a few specialties to help with the things that we weren't comfortable with. I think some of the tenants saw that we're you know transitioning at the air B&B; so they kind of got the hint and left. So more became vacant for us to continue pushing forward to transition all of them. Julia: Oh no I'm saying I think someone we did. Julia: We got lucky there. Mike: You got really lucky I know right. Dealing with the tenants that are angry or you know that want to stay can definitely be difficult. So you know sometimes when you're in the process of kicking them out you know it can be rather difficult. But it sounds like everything was smooth for you guys. Mike: That's awesome, that is awesome. So you guys have been you know renting this out Airbnb you are short term since May. Is Airbnb the only website that you use or do you use other ones as well, like home away or whatnot? Julia: No I think right now we're just sticking to Airbnb. The other ones we are considering. But I think we're probably in a place though is this next coming season. But as of now, strictly Airbnb. Mike: Got it and me mean it's now like almost the middle of November and are your properties still rented out pretty strong or have they slowed down a little bit since the summer? Julia: So luckily they actually has been above 60% occupancy I last checked. It really only started dropping this November. But even then it's still way more profitable than if we were to run it out normally. We found that in the off season more local guests come. A lot of sailors actually booked our listings. Because they just want to get away from the ship. They want their own time and so a lot of local guests are booking around the season. But not less than we expected, so that's pretty good. Mike: Get out of here that's incredible, that's amazing man. I mean so it's you know almost the middle of winter or almost getting into winter I guess. It’s still really telling a fall and the weather is not terrible. I mean today was a pretty nicer day. Wow all right, awesome. So can you tell us what were some of your biggest challenges you know in either getting started or going through the process or what has that been like for you. Julia: Honestly um most challenges that we've had were pretty simple to resolve. I think the only biggest challenge we had was turning units so quickly into Airbnb that we found how to find a system, specifically a cleaning system that worked best for us. Because initially it was like one unit and two units and four and six and then we're at seven and you know having seven guests check out on the same day and having to get all seven prepare for the next guests checking in, you know at first I was a little overwhelming .because we didn't you know expect it to grow so quickly. But I think our biggest challenge is finding a good cleaning system. for us to make sure that all the air babies were ready for the next guest coming in .but we adjusted and we figured out I get to assume and bowel movements are only challenging. Now we're good to go and everything works well. Mike: Wow okay and you guys manage this yourself right? Julia: Yeah I think that's what sets us apart from other Airbnb hosts is that they usually outsource like maintenance and cleaning. But you know my mom was always can do-it-yourself type of person and so am I and she says well as long as we have all our hands, you know why not we take care of what we have to do. Mike: Okay all right, you know hey well you know what I mean you left the military right and you needed a job, that's definitely a job and I'm sure it pays you very well. So that's good. Wow man yeah so you guys cut the costs of outsourcing. Which is great. So you guys can share more of that profit and right it'll keep you busy. So that’s amazing and you haven't had any major issues with tenants that have come in? Julia: Oh no, no major issues with guests. I mean you can't please everybody and there may have been the ones or twos that nothing could be great for them. But you know what happens in customer service. So you just got to roll with it and do the best you can to appease them the short time that they're there. But besides that guests are pretty great they're super friendly, super nice and super cooperative. So nothing ever to strain yet though. I think's pretty good overall when it comes to the guests that we have. Mike: Awesome Wow okay well alright then so then tell us now I mean you guys are almost at full steam. But what are some of your goals? Like what are some of your long-range goals when it comes to this rental space? Are you guys going to try and scale? Do you want buy more properties and Airbnb them out or are you guys just going to stick with what you've got? Julia: I believe I think my mom's plan for her units is to eventually turn them all into Airbnb. as far as my own goals I plan on also you know getting a few multi-families of my own and doing the same thing and pretty much just doing maximizing the best you can with these properties we have and seeing what moves, what works best for us I think is the ultimate goal and making the most profit from them. Mike: Okay all right and do you have any intention on branching out and maybe you know investing in my huge multifamily deals you know or just buying a whole bunch of single family or you're just going to stick with what you know, keeps in the Airbnb thing. Julia: I'm not too sure what my mom's plan is, I know my personal goals eventually have bigger multi families down the road on a lot more experience. I really don't want to set a limit. I mean I do have goals. But this is so far as I can in real estate. It’s truly up to you what you do in this industry. Mike: Wow amen amen, that's incredible girl. I'm telling you that is awesome and can I just ask real quick how old are you again? Julia: I'm 22 years old. Mike: 22 years old, all right. That’s amazing. Everyone listening you guys need to take note of that all right. Cause if she can do it you guys can definitely do it. There is no excuse at all whatsoever. But I mean but amazing testament to your fortitude and testament to your creativity. I mean I think you and your mom are absolutely crushing it and you guys aren't too far from me. So I'm familiar with this area. I know you guys are crushing it. So I got to ask right I mean cut I know that you know real estate isn't everyone's you know like 100 percent thing. I mean has real estate or as you know what you've been doing with Airbnb excited any other passions in your life at all? I mean I'm sure with this nice income that you have coming in I'm sure you've been able to experience quite a few different things right? Julia: Oh for sure. There are a few. But I think ultimately my all I can say is my passion is real estate. There’s nothing else like it. I'm sure other things may come up. But right now being so young this has been the most accomplishing thing I could have ever thought of doing. doing this, it just speak to me and I don't think anything can compare to it just going into real estate and falling you know my passion, my dream there's nothing compared to it. Mike: That's awesome all right well hey you know motivated and focused, I like it. That’s not bad at all. All right so tell me I got to ask you a few more questions as so people can kind of you know get to know you a little bit more on a personal level. But this is a little bonus round, that I take everyone through three questions you ready? Mike: All right awesome. So what is your favorite book and why? Julia: My favorite book is a book called fried green tomatoes at the Whistle Stop cost cafe and it's a movie. It’s an older movie. I don't know how popular it is to the younger generation that I'm a part of. But that used to play on CMC back in the day. But it's actually originally a book and that's my favorite book. because like if you're stressed out you know if you're not having good day, just open that book and it's just about small southern town that you know friendships you know adversity things that they go through and like there's just a lot of funny stories in there and that it is truly just one of those books that brings you joy like just reading it. So that's why it's my favorite book. It has been my favorite book since I was a kid and probably always will be. I think it's because it brings peace to my mind when I read it on a crappy day. So that's why it's my favorite book and it will be my favorite book. Mike: All right outstanding. No that's great. Hey listen you know I mean a lot of things you know a lot of people's favorite books that I've asked you know actually surprisingly hasn't been a real estate-related you know. A lot of times it focuses on that mindset. Because you have to put yourself at ease. I'm sure you've had plenty of times where you're you know second guessing yourself on a decision or whether or not this is the right play or you know or what it is you're doing. Maybe even in that transition period you know you're fighting with your mind. but you know a lot of people realize that hey you got to do something to bring peace into your life right and to clear up your focus and if this is your book, absolutely man go for it you know. Julia: Yeah for sure. 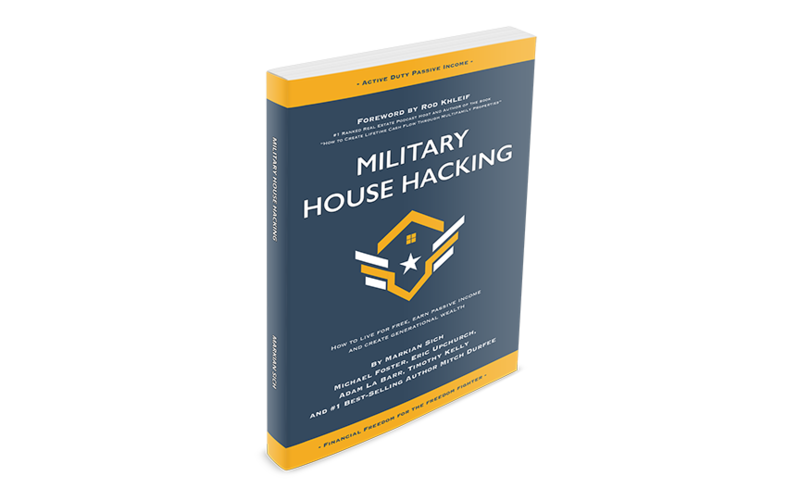 But I will say this Mike I know of another great book and it's called military house hacking and I actually just saw it in the mail today and I ordered it the day you released it I ordered it and I just started in and I got a chance to read a couple pages and honestly there's so much value in that book and I'm excited to finish it and I wish I had this book a year ago. Because if I did I'm sure it would put me at you have a lot more knowledge than I did now you know. Mike: Thank you so much for those kind words, appreciate it and the team and I were very very excited to launch it last week. I think it is actually the craziest thing that any of us have done. So we really appreciate it and guys yeah if you're listening that was the book that we launched. It is available on Amazon. You can get it in an electronic copy or paperback. The link is in the show notes. So make sure you check it out. Awesome, yeah thank you so much. We’re really hoping that we can change a lot of lives with that book. All right all right so question number two, who is your favorite hero or who was your biggest hero and why? Julia: I think if you were asking this question about a year ago what had a difference answer. But today I would have to say my mother is my biggest hero. She literally came to the country, she's originally from Mexico. she literally came this country with nothing and I literally as a child watched her you know make something out of nothing and she literally instilled so many values and us and her kids to that we can do whatever we put our mind to and that if we want something we have to go get it and that nothing comes easy and I think that having a strong foundation like that is probably the biggest blessing anyone could ever have and now that I'm older, I feel like I have to afford her that. Because you know without her without that you know foundation I don't think I would be as confident as I am now go into something like this. Mike: Wow incredible and I absolutely believe it. I mean just you know being able to talk to you and having met you at the past few meetups, I really got to say you know it is clear you know that she has instilled greatness in you and she must be an amazing example and I still want to meet her. Julia: I know she is so elusive. You know my time is over you know, that is your time now like go ahead and kill it and I've been trying to get her out. But you know she's her own person and we'll see if it happen. Mike: Well you need to tell her that I need to buy her dinner or something okay. Whatever you got to do to entice her to come. Because I definitely want to meet her. That is absolutely amazing and I mean I just impressed, I am in awe with you know how much that you've spoken about her to me. Even now on this podcast you know I mean it's amazing and I hope and hope that I'm able to meet her at some point, that's cool. Julia: Yeah for sure. I wouldn't be the person I am without her and I have to bring her up. because you know I would be lying if I said this is all me and I think you comes to a point where you realizing your life like it's really the people around you that help you that really made the difference of who you are and who you're becoming. So I always give her that for sure. Mike: Amen amen amazing. Guys I'm telling you Julia's awesome guys. Humble listen all right and driven. Y’all need to get in contact with her okay. Last question. Last question. What are three nuggets right of wisdom that you could share with those who are just getting started? Julia: Three Nuggets. So anything this is probably the question that I thought about the most. I think the people that you surround yourself with have a major impact on your life and you know you have to network and you can't be afraid to network. you know I'm someone who's just starting off myself and I'm not going to lie you know I was a little nervous to go out and put myself out there. But you have to. If you want it you have to network and just surround yourself with good people, because good things happen. I think that will be my first nugget of wisdom. My second nugget of wisdom that I chose was perseverance. Because you know in real estate deals fall through all the time. You know you will get out bided. You know you might purchase something that is a bigger problem than you anticipated. you know things aren't always going to go your way and I think if you have that hiding mentality you know you can get through anything and just keep your head up and drive through and you know just have perseverance. I think you have to have perseverance especially with industry. Because it's not always pretty. So that's maybe my second nugget of wisdom. I think my third negative wisdom will be for sure, patient. Because real estate is a long game. I have all the things you could choose to do. Real estate is probably the longest game for sure and things aren't going to happen overnight, especially not in real estate and you know things take time. You know everything about you is really it's being patient. Like anything you do with it, you just going to have to take time. Even just buying a house takes time. Like fixing a house takes time, you know appreciating a house takes time. So patience for sure and I think that's it. That’s all I got. Mike: All right no that's amazing, that is absolutely amazing and great wisdom you know to share. I definitely know that a lot of people will you know can value that. I know myself as well. Funny you know that you mentioned about how deals fall through all the time. I was just, I think this year in the past three months I've looked at seven or eight different deals that I've actually you know put offers in Mississippi. Julia: That's funny because since getting into real estate, I put two bids on something and they both fell through and I'm not going to lie I was like dang why do they keep falling through and I'm like Julia shut up, this is your second property you bid on. You have no room to be upset about deal falling through. Because people has bided way more than I have and it's just a patience game really. Mike: It is a patience game for sure. you know I know one of the best books that I've read too is Gary colors millionaire real estate investor and he talks about how you know to be very specific with your criteria and a lot of times you know you'll get over bid or deal will fall through right. but when you're more specific with your criteria and you keep on that same system, those are the best deals that are you know for you right and you'll notice that your wealth will build quickly if you don't get too distracted right. Can’t say that I listen to that all that well. But you know what I mean. I know its good wisdom and I'm trying to get myself back to that whole you know systematic approach to investing. Julia: I feel like it's so hard though in real estate. You can get so creative. There’s so many different avenues and I think you know it's a little tough to stick to one type of you know idea your whole career you know. Mike: That is true yeah I agree, I definitely agree you know that creativity I think it's something that we share which is one of our first conversations. I think that's why we connected so well. So I'm really glad that you know getting you out in this podcast. Because I think you are a true inspiration to folks that are young. But that are getting started. Even if they are a little older right. I mean you can toss that creativity in your situation. Instead of saying hey we've got an underperforming you know multifamily property, why don't we Airbnb it right. And there it is. Mike: That's exactly it man right. Oh my gosh Julie, thank you so much for your time. I really appreciate it. This is absolutely amazing. I really got, again I have to tip my hat off to you. Because you have inspired you know me and so many people around us and that meet up you know when I think when you shared your story everyone was just taking it back. They’re like whaaat! It definitely is and I wish you the best of success in your real estate career for sure. I know we will definitely keep tabs and I'll probably see you again at the next Meet up. Julia: Oh I'll be there. Mike: Alright awesome man, take good care and thanks so much. Julia: Thank you so much and have a good night. Motivating, oh my goodness man. I love it when folk’s especially young folks out there are crushing in the game, are taking action and are just doing wild things in real estate. Listen guys if you have any questions or need any help at all in getting started; please contact us. Because we want to help you take the lead and take action and get into the game man. There are so many opportunities out there and you cannot miss them all right. So hit us up at www.activedutypassiveincome.com. Take our course, take our mentorship, we would love to help you and get in touch with our community on Facebook, on Instagram. There are links to all the pages down there in the show notes. Make sure that you go ahead and check it out and also if you have any questions at all for Julia, hit her up on our Facebook group. Because she is there and she would love to hear from you too. Alright I'm out of here guys.